This article how to add a new content item using the Add Content Item form. When you're ready to start adding content, click the green +ADD NEW button in the top right throughout the Divvy application and select Content Item. This will trigger the Add New Content Item overlay/form. Within the Add New Content form, give your content item a title and a description (optional) that summarizes the item. Then select a calendar, a content type, an associated campaign (optional), and the owner who will be responsible for this item. These values can be changed later if you’re not sure about these details. NOTE: To cut down on campaign clutter, the campaign drop down will only show campaigns associated to the selected calendar that are currently active or ran within the last 6 months. 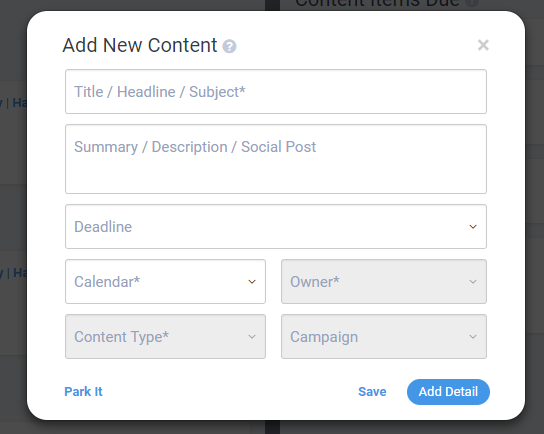 To add a campaign to a content item that falls outside of these parameters, add the content item and then associated it via the sandbox interface. All options labeled with an asterisks are required fields. From here, you have a few options for saving the content item. Clicking “SAVE” will save the content item with a Planned status, so you will be able to locate the item later in the Planned view of the Content interface. Clicking “Add Detail” will take you straight into the DivvyHQ content editor allowing you to add more detail or begin production on this content item immediately. Clicking “Park It” will save this content item in DivvyHQ’s Parking Lot, the storage area for content ideas. You can go to the Ideas area to locate this item later. As you can see, it's very easy to add new content into DivvyHQ, so get to it!